The $60 rig, driven by your cell phone. The reflection of an object can be distorted by undulations of the reflector, be it a funhouse mirror or a fluid surface. Painters and photographers have long exploited this effect, for example, in imaging scenery distorted by ripples on a lake. 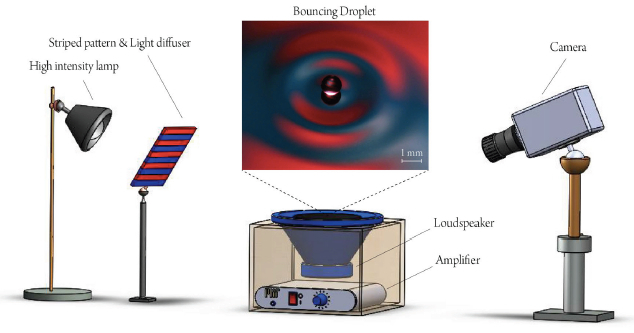 Here, we use this phenomenon to visualize micrometric surface waves generatedas a millimetric droplet bounces on the surface of a vibrating fluid bath. This system, discovered a decade ago (Couder et al. 2005 ), is of current interest as a hydrodynamic quantum analog; specifically, the walking droplets exhibit several features reminiscent of quantum particles (Bush, ARFM, 2015). We present a simple and inexpensive experimental device that allows one to see many striking pilot-wave phenomena. It is our hope that this will be of interest as a high school physics classroom demonstration. See the related Gallery of Fluid Motion Winner: Brun, P.-T., Harris, D.M., Prost, V., Quintela, J. and Bush, J.W.M. (2016) pdf (Link to video from pdf).